Sometimes using less ingredients and allowing the natural taste of food to come through is not only simple and healthy, but also pretty tasty. That’s the case with these sweet potatoes. I’ve brought them to holiday potlucks and family dinners and they always get rave reviews! With two ingredients, it always amazes me how much people like them, even people who aren’t eating vegan or gluten-free. And you can make them ahead of time and reheat – they’ll still taste great. Yep, that’s all the ingredients! I clean my sweet potatoes, remove any dark spots and cook them in an Instant Pot pressure cooker with just a bit of water until soft. You can also bake or boil them. Just make sure they are fully cooked and soft. 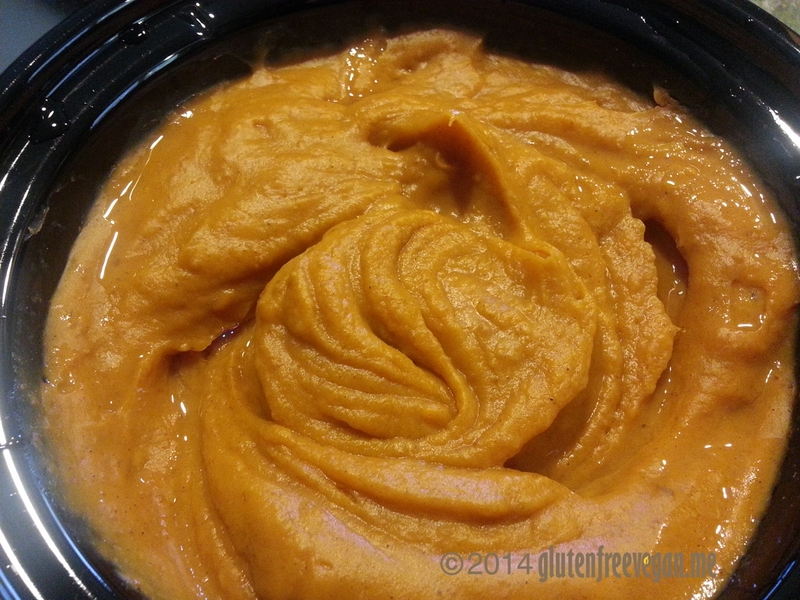 Add the cooked sweet potatoes, skins and all, to a high speed blender or food processor with an “S” blade. puree until smooth, if needed, add a bit of water, heat and serve warm. So simple! This entry was posted in Recipes, side dishes and tagged fat-free, gluten-free, glutenfreevegan.me, glutenfreeveganme.com, healthy, holiday, oil free, sweet potato, sweet potatoes, thanksgiving, unprocessed, vegan, vegan cooking, veggies, whole food. Bookmark the permalink.